MEMBERS JOIN THE BOMBARDIER MARCH AND RALLY ON SATURDAY 23rd JULY. Fourteen members of the Ockbrook & Borrowash Party joined the 10,000 strong Bombardier March and Rally from the Bass’s Recreation Ground to the Old Silk Mill. 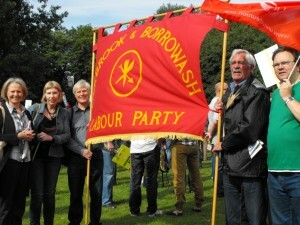 Members marched behind the Ockbrook and Borrowash Banner not used since the late 70’s and early 80’s. Members at the Bass’s Recreation Ground prior to the start of the March. From left to right: Denise Ball: Helen Clark: Philip Whitt: Kev Bates adn Jeff Martin. Those off shot: Alan Clark: Bill and SueCoxon; Ann-Marie Caseley; Dave and Sandra Harrison and Barry Warwick.